AGS Hyderabad recently collaborated with Goonj, a non-governmental organisation, to give donations to victims of the recent floods in the Kerala region. 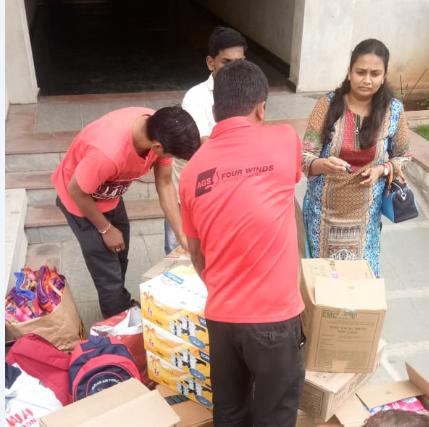 AGS Movers Hyderabad recently collaborated with Goonj, a non-governmental organisation which focuses on disaster relief, humanitarian aid and community development to give donations to victims of the recent floods in the Kerala region. An unusually high rainfall during the monsoon season, which started in July 2018, has led to severe floods and has affected the south Indian state of Kerala. It has been the worst flooding in Kerala in nearly a century with over 483 people reportedly dead and 14 missing. On 29 August, AGS Hyderabad collaborated with several good Samaritans within the city to arrange collections of food supplies, clothes, linen and tarpaulin to be donated to flood victims through Goonj.